The Thayer's or Variable kingsnake. The Thayer’s king snake is an interesting and regularly understated species in the king snake family. It is an absolutely stunning and beautiful example from the family of king snakes! They are from a group called ‘mexicana’ which covers a few sub-species such as Greer's Kingsnake (Lampropeltis mexicana greeri), Mexican Kingsnake (Lampropeltis mexicana Mexicana), Thayer's/Variable Kingsnake (Lampropeltis mexicana thayeri) and their natural habitat ranges from the Eastern Slopes of the Mexican Plateaus in Tamaulipas, Mexico south into central America. They are of the ‘Lampropeltis’ genus (from the Greek "small shiny shield"), a name given to them in reference to their dorsal scales. King snakes are considered by many to be immune to the venom of other snakes in their localities and readily eat other snakes such as rattle snakes. The name ‘King’ in any snake name (e.g ‘King Cobra’) means they eat other snakes as part of their natural diet including their own species. The word for eating other snakes is ‘Ophiophagy’ and therefore many kingsnakes are 'ophiophagous'! Leonis Phase:- This is one of the most widely availabe colour phases in the pet trade as it is most commonly produced when breeding Thayer’s. Their ground colour ranges from very light grey, beige, cream to peachy orange with a very bold red banding outlined with black. Buckskin Phase:- These are not as common as leonis phase but have the closest resemblance to Grey Banded King snakes (Lampropeltis Mexicana Alterna). Their ground colour consists of grey ranging from light grey to darker shades of grey, again with the brilliant red banding oulined with black. 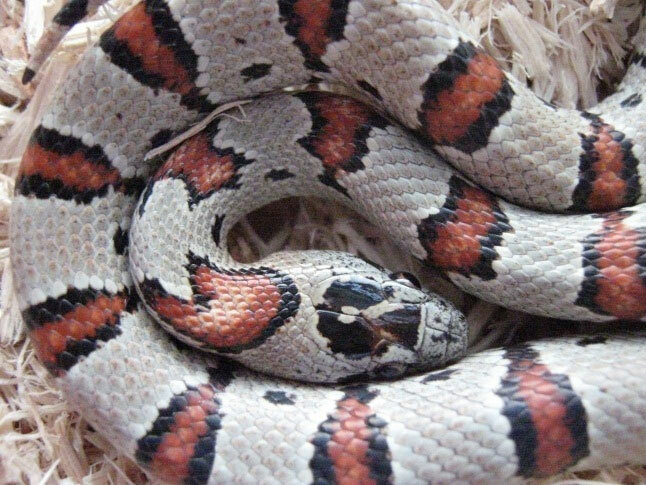 Milk Snake Phase:- These are very similar looking to milk snakes, hence the name but in a way different and have fantastic colours! 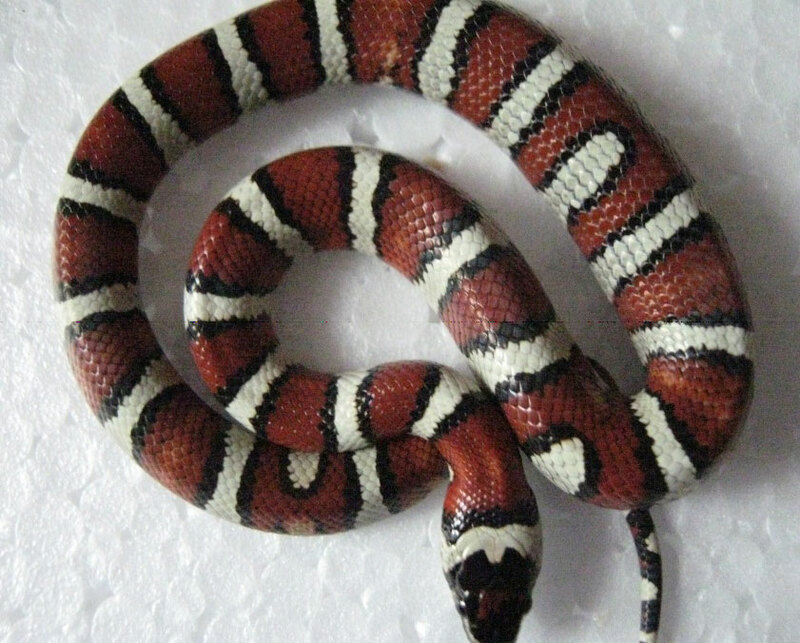 Rather then milk snakes that have the red, black and yellow banding, these have wide red bands as the main colour but rather then having yellowish bands like a milk snake, the milk snake phase Thayer’s seem to be almost white with the black borders around the saddles, which in some ways is more attractive than the milk snakes. Some people consider that they have more of a similar appearance to ‘Arizona Mountain King snake’ (Lampropeltis pyromelana pyromelana). These also are not as common as the Leonis Thayer’s but generally get a few in each clutch of eggs. Black Phase (‘melanistic’- means increased amount of dark pigments):- The Black Phase is the rarest one of them all! You don’t tend to get as many of these in a clutch of eggs which tends to reflect in the price difference when sold in the pet trade or hobby as they are usually more expensive than the other phases. They are solid black and sleek in colour head to tail. If you like Mexican Black King snakes (Lampropeltis getula nigrita), but want something that doesn’t get quite as big with a docile attitude, then this is the snake for you! Thayer’s King snakes make a good choice for a beginner if you are wanting something different to a corn snake. 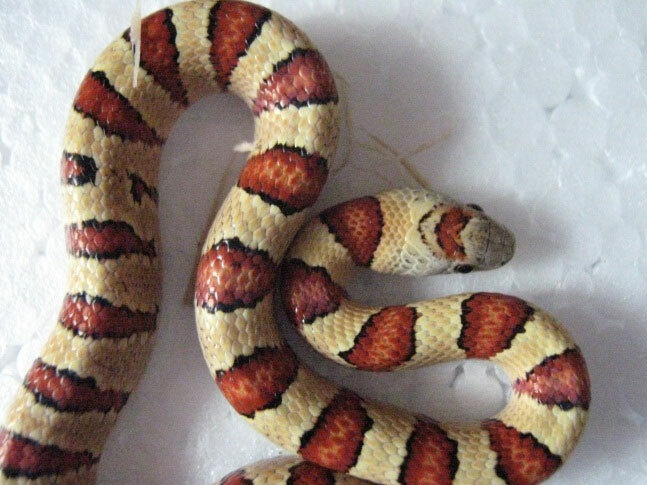 Their temperament is extremely docile and they very rarely bite, occasionally a bit nippy as babies but then so are the majority of snakes. These snakes grow between 2-3 feet in length so as well as being a good species to start with they are also a bit smaller then most corn or king snakes which genarally grow to about 4-5 feet in length. This tends to make Thayers kings an easily handled species! They are very easily maintained in captivity, no harder to look after than corn snakes. They will live happily in a 2-3ft x 1ft vivarium as adults. As babies they will require a smaller cage to house them until they grow to a bigger size. Provide them with a good quality substrate in the cage. We recommend aspen as they may bury themselves if they should choose to and it’s a highly absorbent material that can be easily spot cleaned where needed and is also a non-toxic material that is safe to use with your reptile. If spot cleaned regularly then you will only need to give a full clean out every 2-3 months with a reptile safe disinfectant. Providing your snake with a heat mat that covers a third to half the floor space inside the vivarium at one end is essential and you will need to use a thermostat with your heat mat to enable you to to control the temperature that your Thayer’s King snake needs. Thayer’s king snakes need to be kept so that the warm end is 28c-30c (82.4f-86f). Thayer’s King snakes are nocturnal so no UV lighting is required for them, just the use of a heat mat as mentioned above. Thayer’s like any other snake like to hide away in the day so be sure to provide a minimum of two (preferably identical) hides, one hide should be placed on the warm end and one on the cold end. By doing this you are providing your snake with the choice of hiding while being able to decide if it wants the warm end or the cold end. By having two of the same hides helps the snake not to have to choose between its favourite hide and its ideal temperature. Even though you will have two hides, a good tip is more hides is always better! Povide them with a water bowl with fresh water available daily at the cold side of the tank as this will stop evaporation of the water and uneccessary increase in humidity. A well looked after Thayer’s King snake will live between 10-20 years! Thayer’s are good aggressive feeders and will almost always feed without fail when food is offered to them which also makes them a good beginners snake. They will feed readily on mice that are roughly one and half times the size of the thickest part of the snake just once a week when adults. As babies they are better fed a little more regularly about every 3-5 days as at this stage they are growing very quickly. The only times they may not feed is if your snake is an adult male and it is breeding season as they can go off their food for two or 3 months at a time and the other main reason especially with king snakes is if the temperatures are to cold. To breed Thayer’s King snakes, most people think it's best to brumate them around October-November time. To do this you must cease feeding the snake and continue doing this for about 3-4 weeks before the snake is actually put in to brumation as this ensures the gut is completely empty. If this is not done and there is food left in the gut, then the food will potentially rot inside the snake and can kill the snake. Once the gut has been emptied you may start the brumation process by lowering the temperature gradually over 2-3 weeks until you reach about 10C (50f). The temperature needs to be kept around 10C for about 3 months or even more. In the wild they can brumate anywhere from 3-5 months! This will bring you to around February-April depending on when the process was started and how long brumation period you set. Start by gradually increasing the temperatures over 2-3 weeks until full temperature is reached around 28c-30c. At this point give it another week to fully adjust and then you can begin to resume feeding. Breeding Thayer’s King snakes is very interesting as they are polymorphic. This means that it doesn’t matter which Thayer’s phase you breed with which, you will produce all the colour phases in one clutch so you can’t predict what colour babies you are going to get unlike many snakes. Feed them well for a good month before pairing them together to ensure good health and weight for breeding. When pairing King snakes, great care and visual observation must be taken as King snakes can eat other snakes(although this is unusual with Thayer's. Once breeding has taken place then separate the parents. It is possible to repeat this process a few times to ensure the chances of fertility are good. If the female is gravid, it normally takes about 2 months from breeding to laying the eggs. About a week to 2 weeks prior to laying the eggs the female will have her pre-lay shed. When this happens, place a container big enough for 3-4 snakes to fit in so she has plenty of room to lay in and fill with about 3-4 inches of damp sphagnum moss. Thayer’s King snakes can have clutches of between 6-14 eggs! Once the eggs have been laid, place them in vermiculite or sphagnum moss in a suitable tub in the incubator, set around 26c-28c. At these temperatures the eggs should take between 60-70 days give or take a few days.